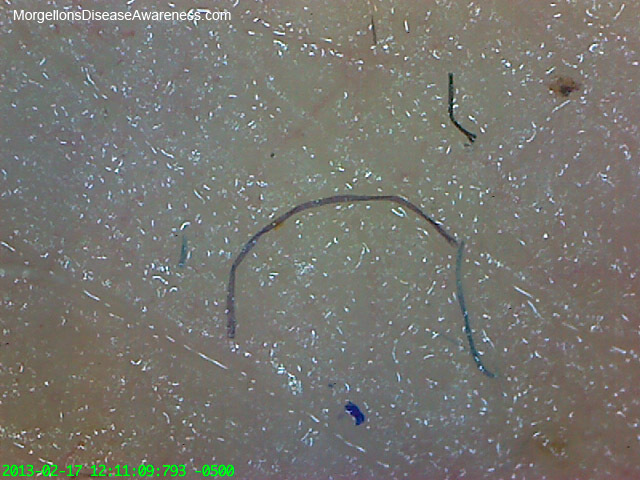 Morgellons sufferers report an array of symptoms happening just under the skin, such as the emergence of fibers and filament clusters, specks, particles and sand shaped granules, yet physicians are unaware of this phenomena because they are not using enlargement devices. An unaided visual exam using the naked eye is no longer appropriate to an emerging illness involving so many artifacts. No one trusts the judgment of a mechanic who refuses to look under the hood of a car. 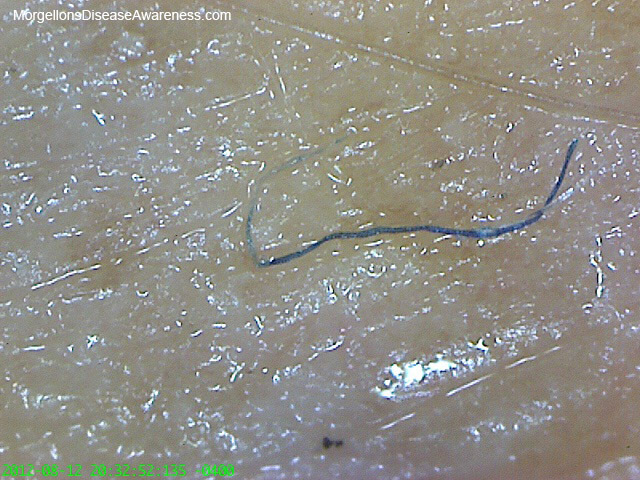 A more thorough approach needs to be taken using equipment such as dermascopes and microscopes, as this is the only way to identify the microscopic fibers that are the defining symptom of Morgellons, and which separates it from all other diseases. 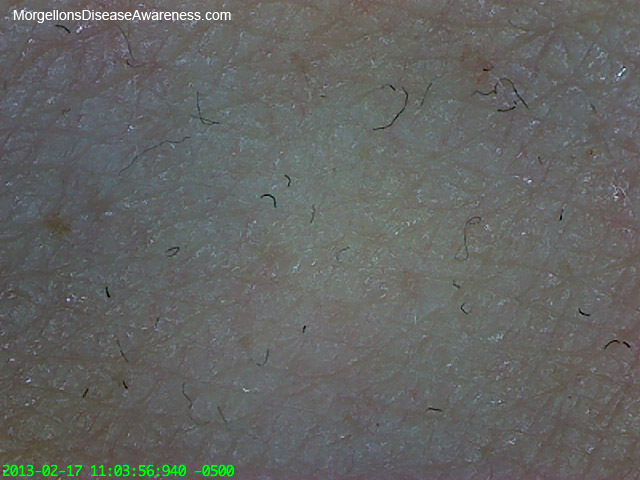 Using a dermascope can also prevent misdiagnosing diseases that have some similar symptoms, such as Lyme (although some patients may have both). 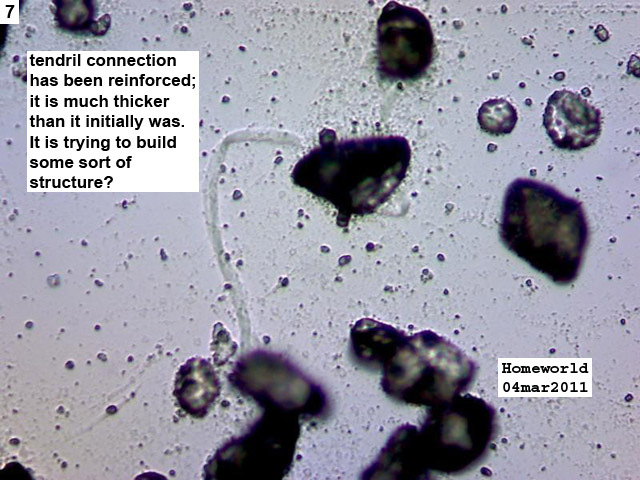 Microscopic enlargement needs to be at minimum 60x-200x in order to see the fibers clearly. 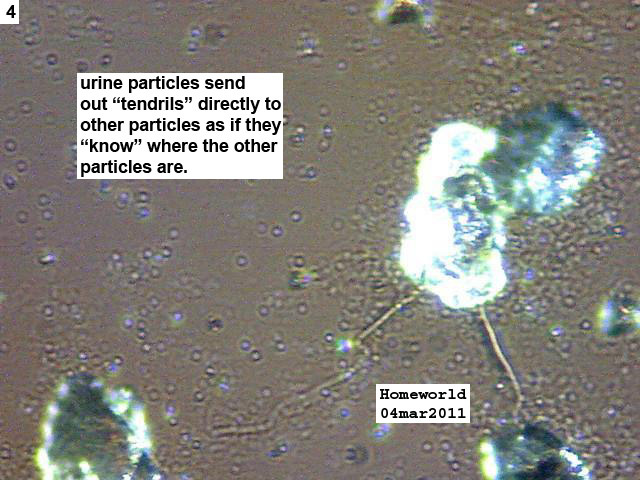 • ﻿Randy Wymore, Director of OSU-CHS Center for the Investigation of Morgellons Disease and Associate Professor of Pharmacology and Physiology had the fibers analyzed at the Tulsa police department's forensic laboratory. 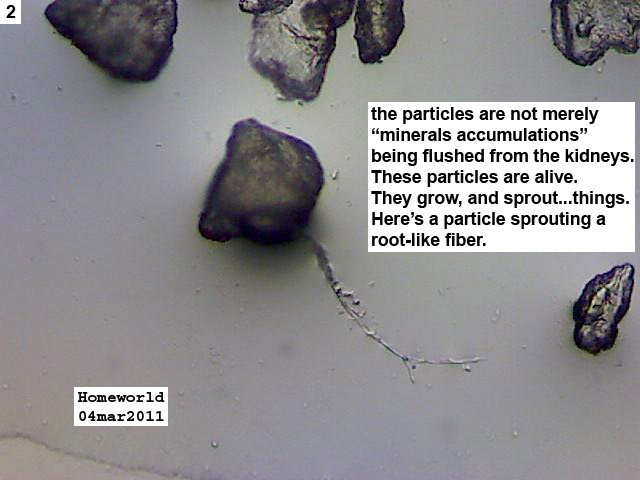 The Morgellons particles didn't match any of the 800 fibers on their database, nor the 85,000 known organic compounds. 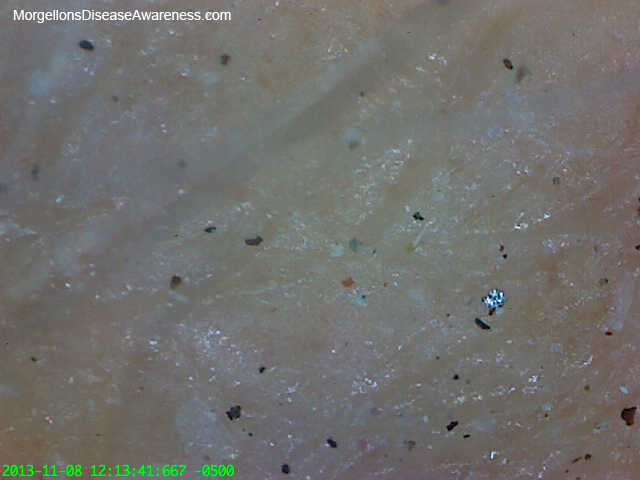 • ﻿Morgellons sufferers going for the test at Fry Labs are testing positive for a previously unknown protozoa. 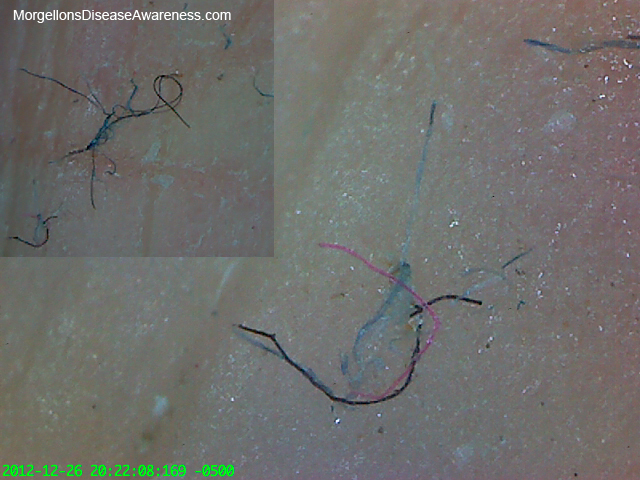 Morgellons disease (MD) is a term that has been used in the last decade to describe filaments that can be found in human epidermis. It is the subject of considerable debate within the medical profession and is often labeled as delusions of parasitosis or dermatitis artefacta. This view is challenged by recent published scientific data put forward between 2011-2013 identifying the filaments found in MD as keratin and collagen based and furthermore associated with spirochetal infection. The novel model of the dermopathy put forward by those authors is further described and, in particular, presented as a dermal manifestation of the multi-system disease complex borreliosis otherwise called Lyme disease. A differential diagnosis is drawn from a dermatological perspective. The requirements for a diagnosis of delusional disorder from a psychiatric perspective are clarified and the psychological or psychiatric co-morbidity that can be found with MD cases is presented. A concurrent case incidence is also included. Management of the multisytem disease complex is discussed both in general and from a dermatological perspective. Finally replacement of the term ‘Morgellons’ by ‘borrelial dermatitis’ is proposed within the profession. "In summary, histological observations and electron microscopic imaging from representative MD samples suggest that dermal filaments are composed of keratin and collagen and result from proliferation and activation of keratinocytes and fibroblasts in the epidermis.﻿"
Bovine digital dermatitis is an emerging infectious disease that causes lameness, decreased milk production, and weight loss in livestock. Proliferative stages of bovine digital dermatitis demonstrate keratin filament formation in skin above the hooves in affected animals. The multifactorial etiology of digital dermatitis is not well understood, but spirochetes and other coinfecting microorganisms have been implicated in the pathogenesis of this veterinary illness. 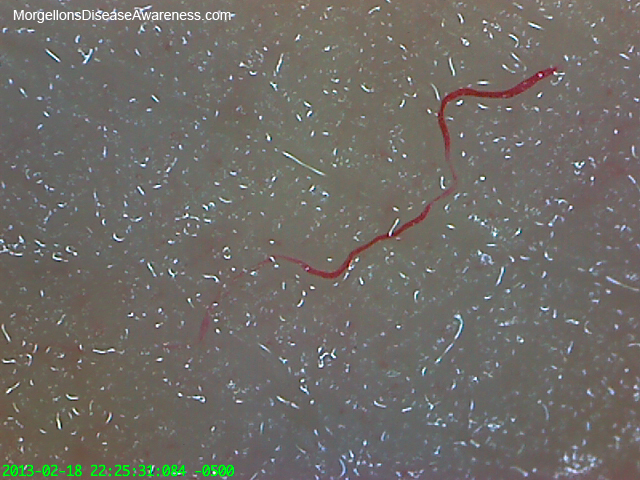 Morgellons disease is an emerging human dermopathy characterized by the presence of filamentous fibers of undetermined composition, both in lesions and subdermally. 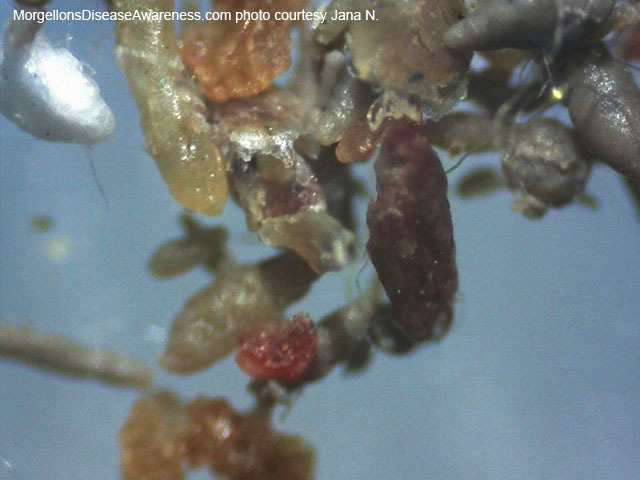 While the etiology of Morgellons disease is unknown, there is serological and clinical evidence linking this phenomenon to Lyme borreliosis and coinfecting tick-borne agents. 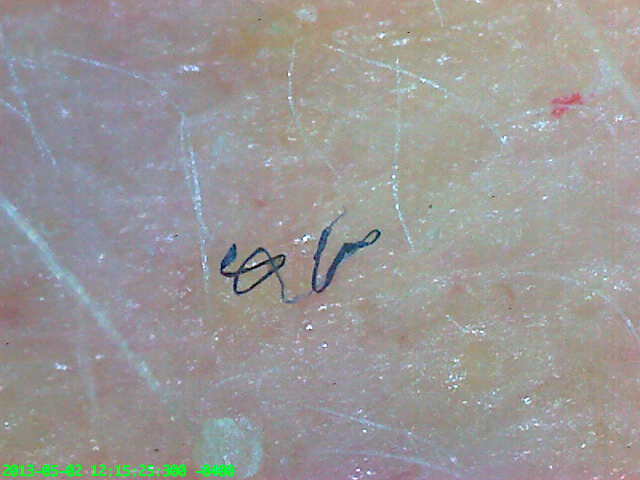 Although the microscopy of Morgellons filaments has been described in the medical literature, the structure and pathogenesis of these fibers is poorly understood. 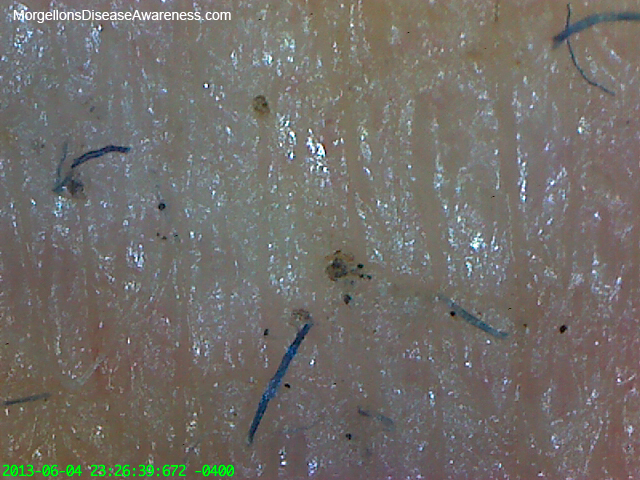 In contrast, most microscopy of digital dermatitis has focused on associated pathogens and histology rather than the morphology of late-stage filamentous fibers. Clinical, laboratory, and microscopic characteristics of these two diseases are compared. An excerpt from Dr Horowitz's latest book, "Why can't I get better?" 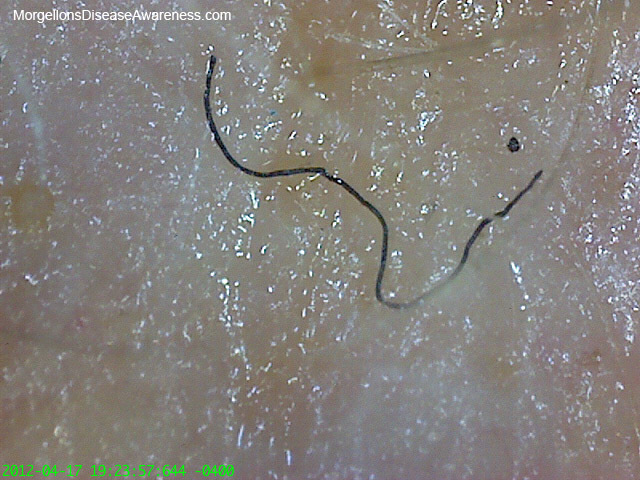 "Although we still do not completely understand this syndrome, I have treated Morgellons patients successfully, starting with using the sixteen-point MSIDS diagnostic map to ferret out any underlying health problems and treating with the same antibiotics used to treat Lyme and associated co-infections. The most effective antibiotics have included tetracyclines (doxycycline, minocycline), macrolides (Zithromax, Biaxin), Septra DS, and quinolone drugs (Cipro, Levaquin, Avelox, and Factive). Often the skin lesions and associated symptoms resolve once the above antibiotics are used in a comprehensive treatment plan"
Horowitz, Richard (2013-11-12). Why Can't I Get Better? : Solving the Mystery of Lyme and Chronic Disease (Kindle Locations 2662-2666). St. Martin's Press. Kindle Edition. scabs, is not possible based on the observations that were just described. Light dusting of sediment; just enough to cover the bottom of a 15 ml vial. Particles extracted with pipette; one drop on a slide, no stain. Camera used: Celestron 44306 imager placed on the eyepiece of a MI-5000 STD microscope, using 4x and 10x objectives. 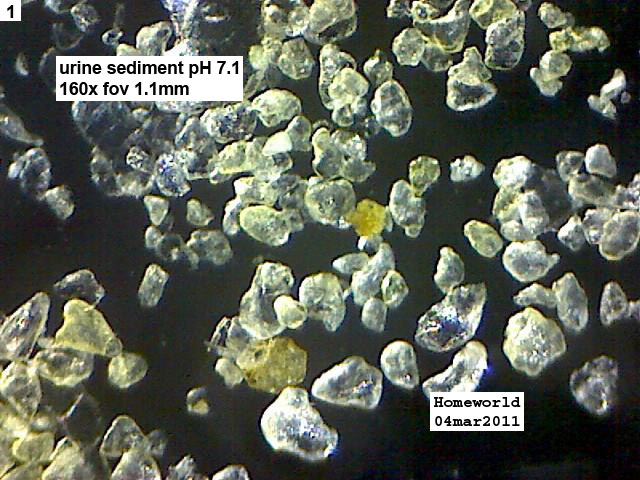 Homeworld's observations: "The photographs display evidence that the urine sediment is not merely mineral accumulations being flushed from the body. The photographs indicate that the particles are very active, and are growing "tendrils," fibers," "ruffles," protrusions," and are creating connections between themselves. 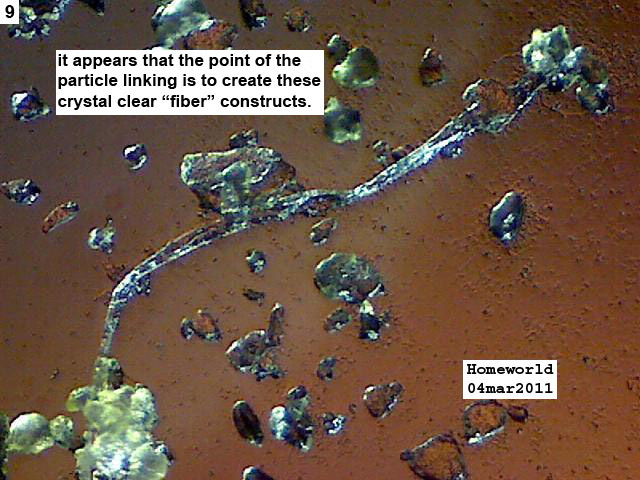 These connecting "fibers" appear to be creating translucent "crystal clear" objects that give the appearance of "crystal fibers." This is a costly illness with many patients seeing anywhere from 10-60 doctors without a diagnosis. Often these visits are out-of-pocket expenditures as patients escalate up the food chain to specialists not within their health plans, bankrupting themselves unnecessarily. Having a diagnosis will allow sufferers to make informed decisions about their next healthcare choices. 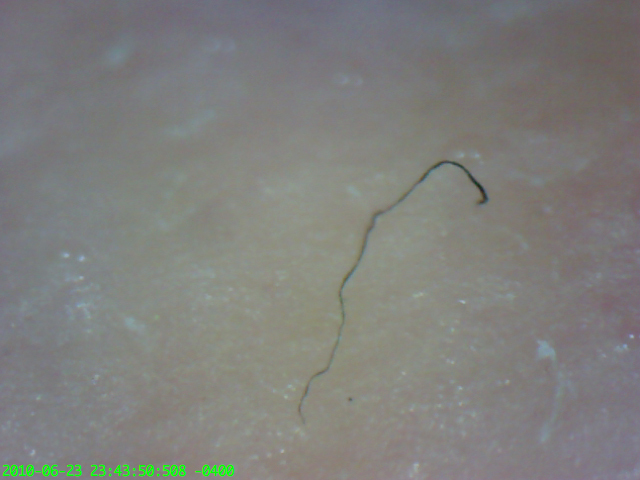 There is no silver bullet when it comes to Morgellons. A holistic approach working with diet and pH, plus supplements to rebuild the body's systems is one avenue towards proactive change and symptom reduction. I hope there is enough material here for you to consider that there is a serious health situation going on. 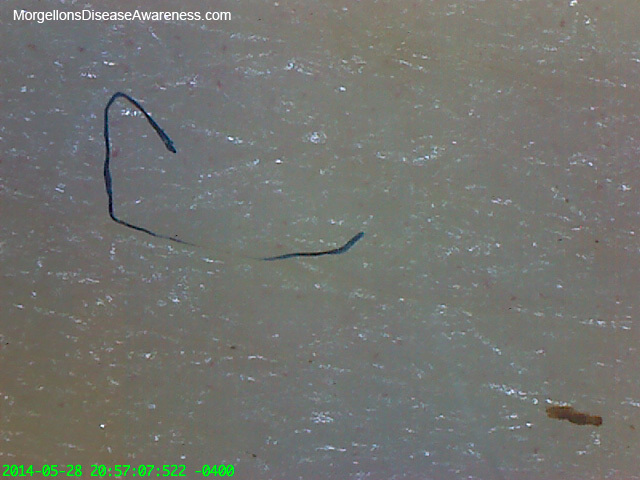 Fibers under the skin can clearly be seen in these photos as well as in urine and stool, plus the lab doing DNA testing has noted that they are seeing fibers in stool samples. I truly do not understand how this could be misconstrued as a mental illness—and anti-depressants and anti-psychotics are not a fix. This community is looking for a way to repair the health of the body. 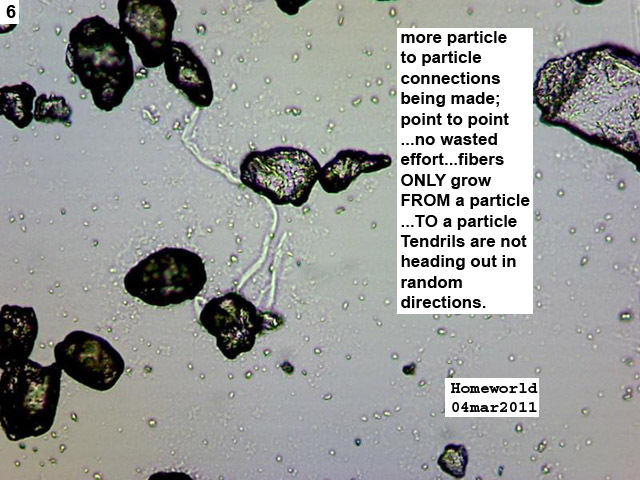 You have power to move the Morgellons cause along, if only you will participate. We need your support and input as health "authorities" to bring credibility to the phenomenon﻿ happening. If you think there are not enough people sick with this disease to warrant your time, think again and heed a call from those of us who are looking at the skin of our friends and families and are finding fibers in them. As of yet, this "healthy" population is asymptomatic, but we believe they are carrying the seeds of this disease in their systems. When and if they will become ill is still to be determined. The sooner you look, the sooner the alarm bells can be sounded. 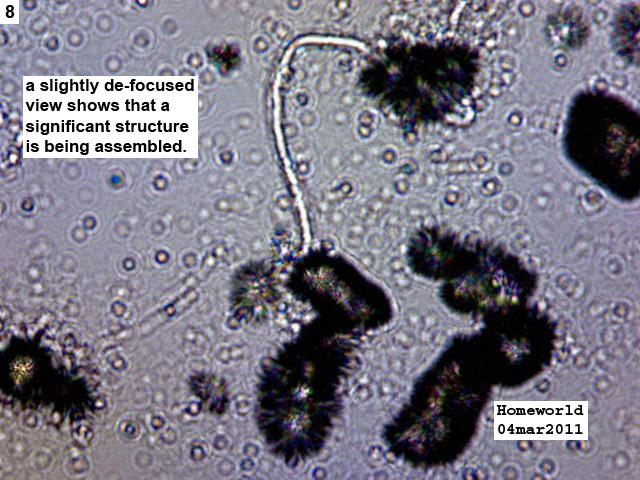 If I can do this with a $70 microscope, so can you. Imagine a world in which every patient going for a physical with their GP or dermatologist had 3 minutes devoted to examination of the skin with a scope—and what kind of data could be gathered from this! That's the kind of world I would like to live in. One final note before I step off my soapbox is to reinforce the oath you took on becoming a doctor. "Do no harm." Putting in someone's record that they have Delusional Parasitosis (DOP) has long-term unforseen effects on the lives of the patient and if you are unlicensed in the mental health field, you do not have the authority, qualifications, or training, to make that judgement call. DOP in patients records have led to loss of their legal rights, hospitalization against their will and in some cases children being removed from their parents. Please think of this before you act. 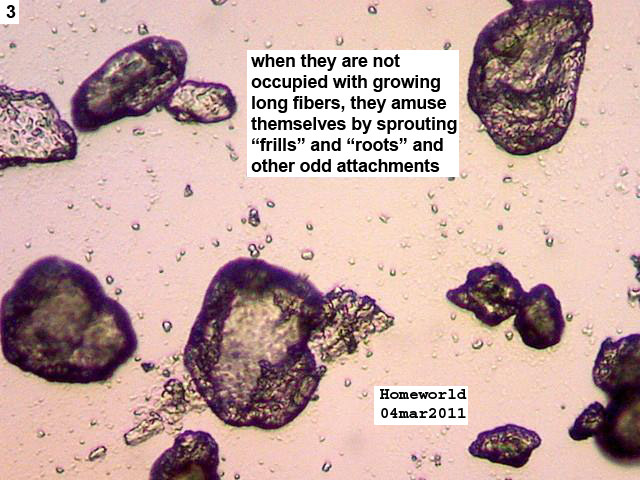 Above: Fiber is magnified 200x. Notice how it is being pushed up out of the skin. a half hour of application. 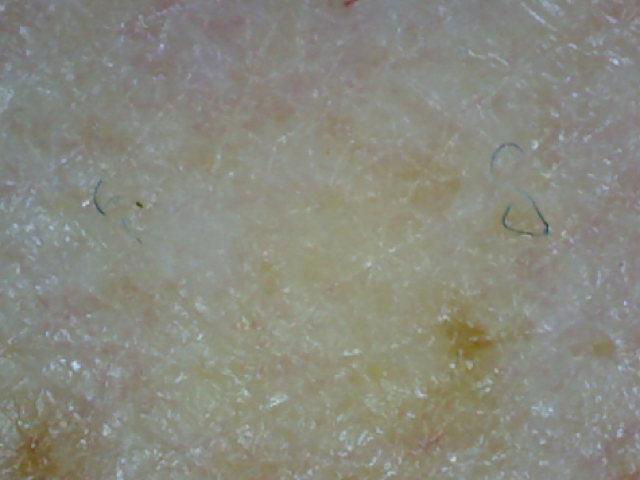 Below: Enlargement shows both fibers still under the skin, as well as emerged. 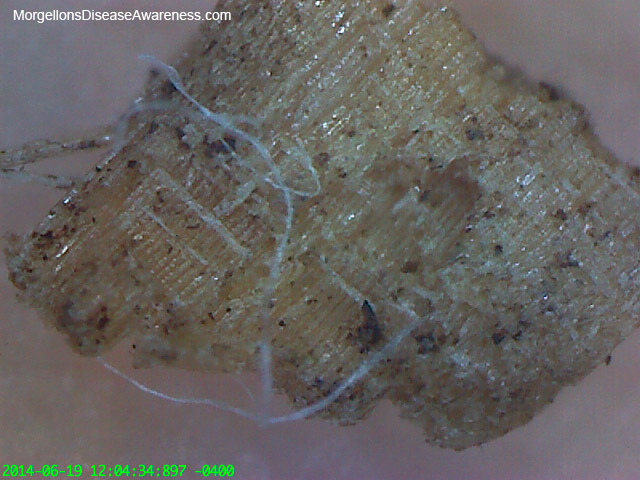 Above: Various artifacts that came from the skin of a Morgellons sufferer. 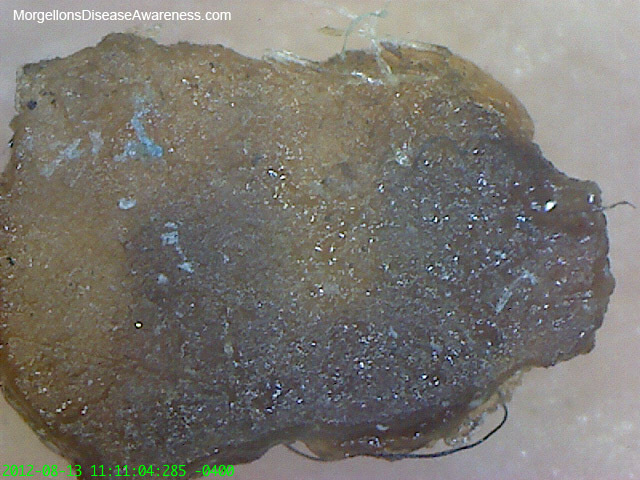 Above: The underside of the Morgellons lesion reveals a complex root system. Anonymous submission. 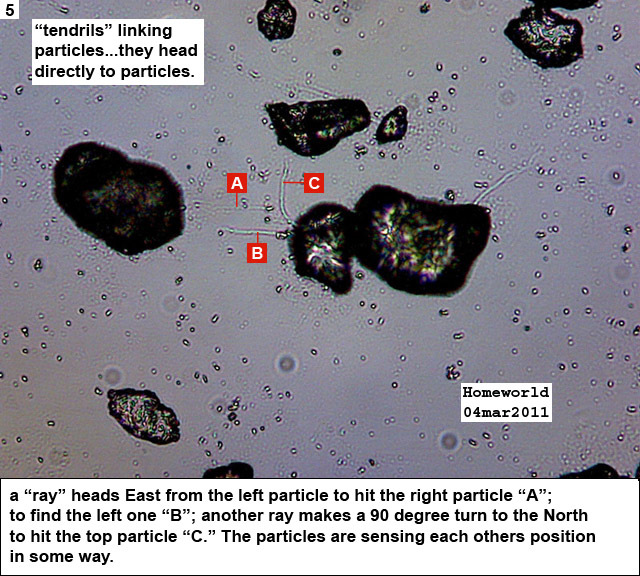 Above: A vast array of particles and artifacts emerging from the skin. Note the golden gel (center) which also appear in lesions, and stool.